Flavour: Pungent espresso coffee without the bitterness. One of our strongest ‘espresso’ type coffees based on a dark roast Costa Rica. This coffee has a firm, smooth, strength at this colour. To boost its strength we have added a small proportion of Continental Blend. This is a very pungent espresso coffee without the bitterness found in darker roasts. Outstanding service. Will definitely use you again. Lovely, Lovely coffee! Very quick delivery. Would highly recommend. Excellent range of coffees at keen prices. All that's required for a quality caffeine fix. That's why I'm a returning customer. Great service, no issues will use the service again. Cracking service as is usual. Even the Postman was interested and came in for a coffee! I have quite a selection to try now.... can you have too much? Customer service is excellent. My initial order arrived incomplete but was rectified immediately. Have tried 2 of the 5 coffees and very impressed with both. Will order again. I bought four blended coffee's. So far we've used two, Mountain Blend and San Marcos, they've been a smooth, tasty, rich coffee without the burnt taste or bitterness that so often accompanies supermarket bought coffees. Delivery was quick, using next day delivery which is well worth paying for when you're desperate for a decent cup of coffee! We thought our previous coffee supplier was good but The Love Of Coffee is even better. We'll definitely be buying from here again! Coffee is very nice, the delivery was very fast. All was good! Thank you. I don't usually like the blended coffees but decided to try this as t was new to the site and the description sounded good. It is my new favourite coffee! 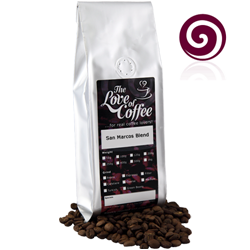 We've now been trying your new San Marcos Blend coffee for a few days, using a bean to cup machine, and can say that we like it. It's as described, strong and full bodied without being bitter. It's now one of our favourites and we will definitely be ordering more before Xmas.